In the recent years, Prague has become one of the top European destinations and has been increasingly compared to other major capitals such as Vienna, Paris, Madrid. Indeed the city is wonderful, with its well restored historical buildings, the lovely tiny streets in the Malà Strana, some beautiful examples of Baroque architecture, the charm of the Charles bridge crossing the Vltava river. However, I wonder how many people visiting Prague remember how the city was in the past. 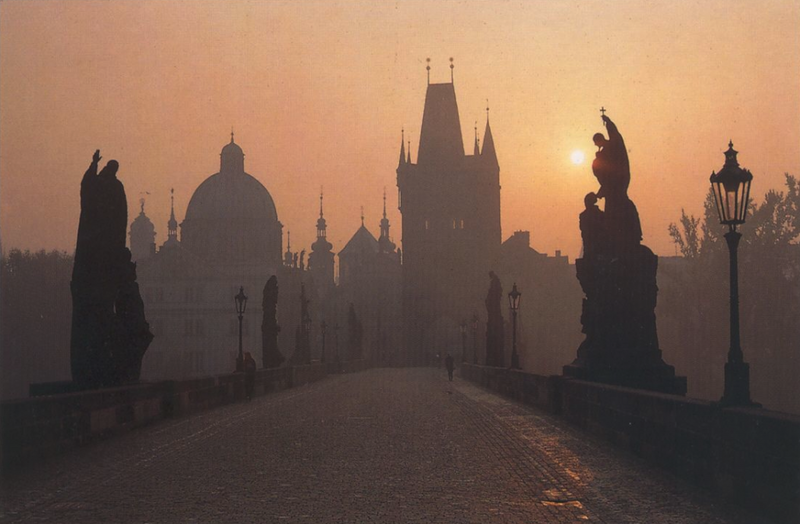 I went to Prague for the first time 30 years ago, in 1980. The USA and USSR opposed blocs were in some way leading the world, Berlin was split in two by the wall and the Eastern Europe countries were under the USSR and communist influence. Czechoslovakia was one of the countries where the authoritarian government was tougher, exercising a strong control over personal freedom and imposing strong limits to foreign Western visitors. The journey to Prague was our ‘bachelors’ trip’ and proved to be quite an awesome and interesting experience. Changing the train at a little station in the middle of nowhere in Eastern Germany, in the middle of the night. It was somehow surreal. Wondering why? Only special trains were allowed to cross the border, trains that could be easily searched to prevent and block possible attempts to escape from the country. Approaching the border and throwing away from the windows any forbidden reading: Western magazines but also many books by authors that were banned. A little before the border, there was the so-called No Man’s Land, a desolated area with huge towers where guards controlled the surrounding area. Once reached the border, the train stopped. The area was very strongly illuminated and armed soldiers controlled every door to ensure nobody would step down. More soldiers started to sifting out the train. Not only the usual Passport control. They checked the toilets, disassembled many pieces to ensure nothing suspect had been hidden, they verified both the top and the bottom of the wagons. As you can imagine, the stop was quite long and the tension high. Nobody dared talking, we were all barely moving. We knew that those days the smallest thing raising a shred of suspect could compromise the journey of all people traveling on that train. We were lucky, since after a long and painstaking control the soldiers eventually gave the green light and we left to Prague. The arrival: As soon as the train stopped at Prague railway station, we were ‘welcomed’ by our guide. At that time, the function of the guide in a communist country was very different from the current meaning. His main task was not to show us the city, the life, the people. On the contrary, visitors had to follow a precise scheme, where contacts with the locals and strolling around freely were not permitted. Besides leading us to visit the main landmarks and the classic tourist attractions, his main function was to control. What we did, what we said, where we went. What a fascinating read my friend. I had no idea of the history or the fact that Czechoslovakia didn’t even exist until 1918…and I am Czechoslovakian! Now I am not sure what I am … Austrian or Hungarian? Beats me. I loved this article and hope you do more like it! I’m so glad you liked it, Jeff. I wanted to tell about this experience because the sight of Prague today is so much more different and most people don’t even know how the city looked like during the Cold War. History, even when sad, is always good to know. To remember, to avoid repeating the same mistakes. Just because Czechoslovakia didn’t exist,doesn’t mean Czechs and Slovaks didn’t exist. Our languages and culture are obviously not even a bit similar to Germanic or Hungarian. We are Slavs and no one could erase that (even though they tried…) Austria-Hungary also only existed from 1867. 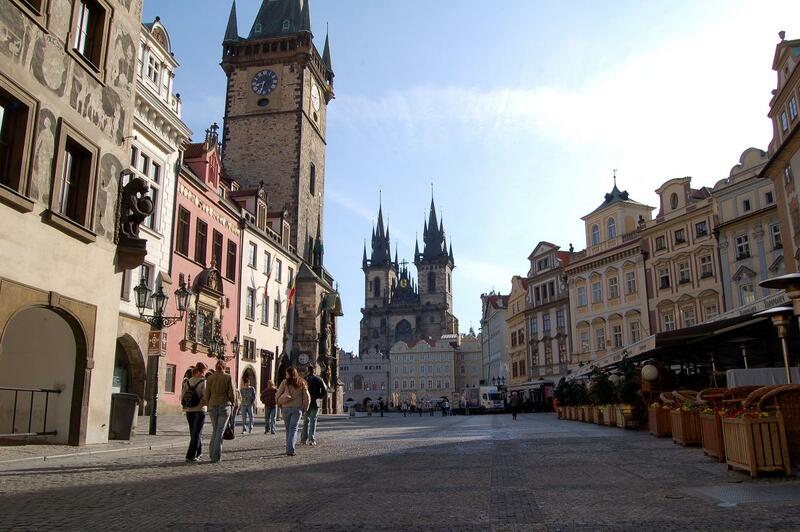 Would love to visit Prague someday, isn’t it one of the only cities in Europe that didn’t get bombed during WWII? Thanks for giving me a reminder of just how lucky I am to travel relatively without fear and with ease. In 1980 there was no Internet to immediately get info about other’s experiences. And much of Europe was entirely different a mere 32 years ago. We are finally making a trip to Prague this summer. Hope it still looks as great as these pictures. Prague is wonderful, although it has changed a lot. I’m sure you’ll like it! This is a refreshing change from most travel blog posts. Not only does this post reflect an interesting experience traveling, but also illuminates what life was like during the Cold War and what travel was like for those few that could cross the iron curtain. I am now going to read part II. Wow! 1980’s tourism to Prague was completely different from today’s tourism. Would have loved to experience that time when it was Czechoslovakia… pretty freaky that train ride. Prague is one of my favourite places (other than Vienna) – it’s so romantic and has that old-world charm to it 🙂 However, I have just been there in July 2010, and only managed to visit the Old Town section. I have read the Part 2 of Prague, and I can tell you, now the people there are so cheerful and happy, totally unlike what you had described in your memories..
Have you written Part 3 of Prague? 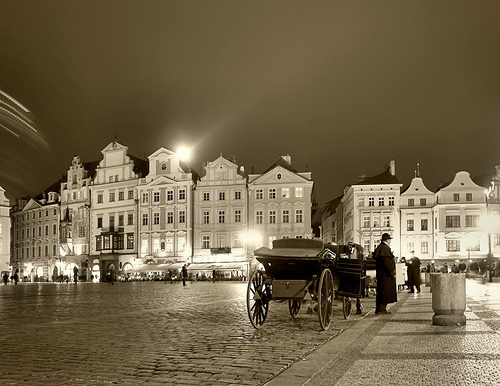 Prague is a wonderful city as are many places in Eastern Europe that have been blooming in the recent years. I just wrote the 3rd episode of my journey to Prague and I hope you will enjoy it. I’m not the author for the shots (back then, cameras where quite basic) but I agree with you that is has somehow a medieval feel. I believe, however, that it is quite recent. If you’d like too see photos of the ’80s have a look at Part II. Cheers! I, too, loved Prague. Ever since I watched INXX’s video…hahaha, what can I say, I’m a child of the 80’s-90’s…! But seriously, Prague was wonderful even though we go robbed in the train there. I love Prague. Visited there in 2006. The architecture is amazing, and a very romantic city. It is just a shame that it has become a popular destination for stag and hen parties. My advice to anyone visiting the city now, is if you want to avoid the crowds of drunken Brits, is go midweek. That’s very interesting, Darren. I got back to Prague in the early ’90s (that will be episode 4, but I’m still writing episode 3…) but since then… I never dared, although I’ve been thinking at going back several times. I’m afraid of what it has become. Not quite sure I’d really like it. I don’t think that the city will have changed that much, just a lot more drunken tourists there at the weekend. It’s a gorgeous city, and I would go back again. I visited in the early 90s. It was an incredible time in Prague. Oh, that’s interesting. In the early ’90s I had my second trip to Prague, and things had already changed from my first visit although the city/country was far from what it has become meanwhile. I just visited Prague last month so hearing what it was like 30 years ago is fascinating. You describe this experience so clearly, I can almost feel the stress of taking that train, I can’t wait to read part 2! It must’ve been so interesting to visit at that time, it’s such a well trodden city now it is strange to think of it as anything but. The train journey sounds a little hairy but probably exciting too? My latest guest post below explores similar ground, it’s about what happened to Berlin’s subway during the cold war era. Thanks for sharing an interesting slice of history, and beautiful pics accompanying it. What an interesting trip down memory lane. I remember travelling in Eastern Europe in the 80s: East Berlin, Karl-Marx-Stadt, Leningrad, Czechoslovakia, … the names are all changed now. And all the checkpoints, controls, illegal changing of money in back alleys, even the possibility of being interrogated – it was all rather exciting, wasn’t it? I was in Prague in November 1989 and left on a Thursday evening, The following day, was the Velvet Revolution. Talk about missing out on the action. Good to hear that you also travelled through Eastern Europe in the ’80s. I recognise everything in what you write… True, it was quite exciting. And a little sad… Can’t believe that you missed the Velvet Revolution for just one day! Hard not to love Prague. Nice post. Thanks for letting me re-live it briefly. Nice to know that you enjoyed the story. Stay tuned. Part II is soon to come! Wow! It’s good to reminisce like this – makes us realize how far we’ve come from those days. Great post. Thank you, Barbara. Some places in the world changed so much during the last 25 years and I thought it might be nice to remember how they were. Glad you liked the story.